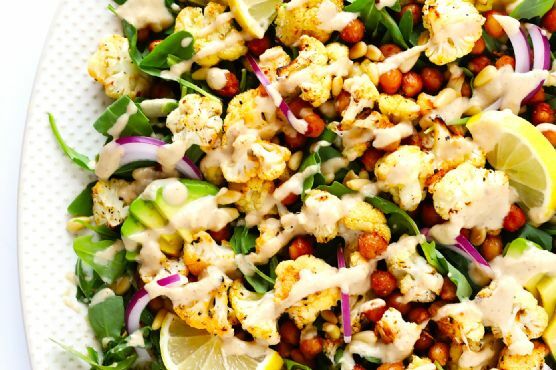 To Make The Salad:Prepare the Roasted Cauliflower and Chickpeas as directed below. Then to save time, prep the remaining ingredients while they are roasting in the oven.Once the cauliflower and chickpeas are ready to go,spread the arugula out evenly on your serving platter or bowl. Top with the cauliflower, chickpeas, avocado, red onion, and pine nuts. Then drizzle everything evenly with the dressing.